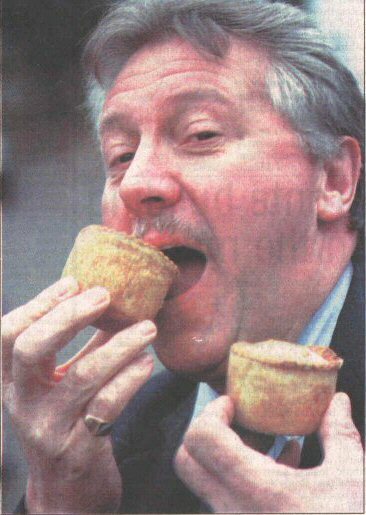 Celebrity Chef Brian Ate All The Pies! Celebrity chef Brian Turner was in Ripponden on Saturday to judge the 10th annual charity pork pie competition. He and other judges munched their way through 51 entries at The Old Bridge Inn before Mr. Andrew Jones, who runs Jones' Butchers, Bethel Street, Brighouse, scooped first place and a silver trophy. The event, sponsored by Timothy Taylor Championship Beers and organised by the Pork Pie Appreciation Society, raised more than £700 for Elland Silver Band and the Jonathan Haigh Trust. Other local butchers J. and P. Cryer, of Ovenden Road, Halifax, and S. R. Heseltine, of Southgate, Elland, were also finalists. Champion pie maker Andrew Jones said he was delighted. with his success he is already a Cornish pasty champion alter winning the National Federation of Meat and Food Traders competition in July. "Credit must go to my staff who produce the pies and the people I buy my meat from. We have "gone back to basics with a traditional recipe," he said.